Filipe Toledo looked on point but couldn't pass fellow countryman de Souza. Mick looked on fire throughout the entire event. Gabriel Medina may have been involved in a controversial interference against Nat Young but he made just as much of a statement at this event above and below the lip. Adriano will forfeit the Jeep Yellow Jersey to Mick after his runner up finish at Lowers. Mick with a textbook gouge. Peter Mel said it best, "Fanning is like a cobra!" Mick mixes it up on his way to a 9-point ride in the final. Meet your current world number one going into Europe. 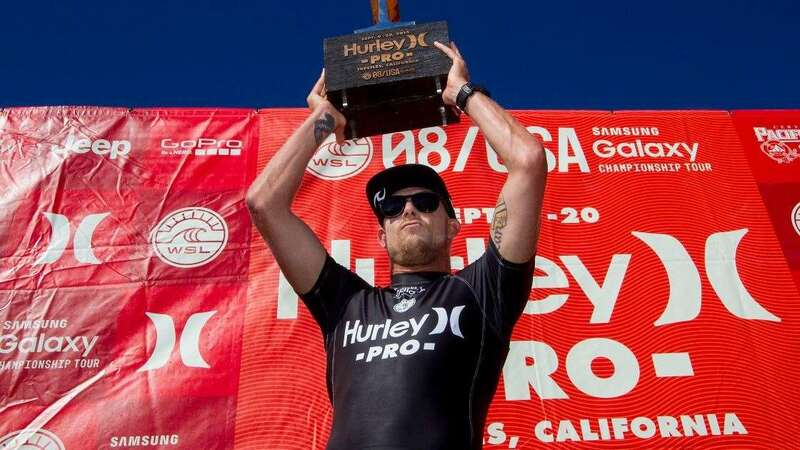 Three-time World Surf League Champion Mick Fanning has claimed the 2015 WSL Jeep Leader Jersey after squaring off against then-ratings’ leader Adriano de Souza in a hotly-contested Final at the Hurley Pro at Trestles. On the women’s side, two-time WSL Women’s Champion Carissa Moore bested South African Bianca Buitendag to take the Swatch Women’s Pro at Trestles, her third Championship Tour victory of the season, and take the ratings’ lead heading into Europe. The Hurley Pro and Swatch Women’s Pro, stops No. 8 and 7 respectively on the 2015 Samsung Galaxy World Surf League Championship Tour, enjoyed classic California conditions during the opening days of the competition window, allowing the world’s best athletes to raise the bar on high-performance surfing. While conditions today were a departure from those enjoyed during the initial rounds, the performances of the WSL elite remained razor sharp and the competitive nerves steely. “Every heat has it’s challenges,” continued Fanning. “From the first heat, to Round 3 against Kolohe Andino and then Kelly, Ace Buchan and Gabriel. When you’re surfing on the Championship Tour you surf against the best in the world. A fourth world title won’t be easy, especially when I have to surf against people like Adriano. De Souza became the first Brazilian to make a Final at the Hurley Pro today and adds another great result to his season despite dropping down one place on the Jeep Leaderboard to No. 2. De Souza previously went head-to-head with event standout Filipe Toledo in an all-Brazilian Semifinal. A passionate De Souza stamped his authority on the heat with an excellent 8.33 but Toledo closed the gap with an 8-point ride of his own. The pair each took a wave in the final seconds but Toledo didn’t get the score required and goes home in third place, moving up on place to No. 3 on the Jeep Leaderboard. Fanning dispatched reigning WSL Champion Gabriel Medina in the second Semifinal. Medina’s pair of 8-point rides couldn’t match Fanning’s impressive 18.17 heat total. Today’s result for Medina is his best ever at Lower Trestles and he moves up from 10th to 7th place on the Jeep Leaderboard.